After years of wild rumors, hoopla, broken budgets and a lot of waiting around, Guns N' Roses' much-publicized Chinese Democracy finally hit the Best Buy shelves today. This being a media event, MusicRadar moseyed on down to the local Best Buy (in this case, West Paterson, New Jersey) to spend an hour and scope out the first-day action. Would there be wristband-wearing fans camped outside, breathlessly anticipating the chance to lay their hands on the Holy Grail? Would the racks be cleaned out of CDs in a matter of minutes? Would Chinese Democracy-mania be raging? The scene inside the Best Buy seemed to be business as usual for a Sunday at 10am. About 20 or so customers were in the store, most of them in the computer and video game aisles. We caught up with a couple of friendly employees who were stocking a display case with Chinese Democracy CDs. Neither wanted to be identified, but they were happy to pose for a picture. Then, after a few minutes, Peter Zanzonico, 40, of Nutley, New Jersey, approached the display. "I did the pre-order," Zanzonico explained. "I gotta check my mail and see if it's there. I'm big into rock 'n' roll, so you know, I'm into the Guns. And besides, this is an event, right? Still, I'm a little disappointed. I thought Best Buy was going to do a big promotion on this record. There's no posters or anything. I guess they're taking a slow approach." Ten minutes later, Alex Chu, 32, of Garfield, New Jersey, came over and picked out a CD. "I'm a big Guns N' Roses fan," Chu said. "I haven't heard any of the new songs, but I think I'm going to like it anyway. Axl's voice is totally unique. I love Slash too." Fifteen minutes later, Ray Van Kat, 47, and his father, Joseph, 75, of Midland Park, New Jersey, bought three copies. "I'm a fan from way back," said the younger Van Kat. "I don't know if I'm going to like this new record, but I have to give it a try. My son, Zach, he says it's good - he heard it on the Internet." And what about the elder Van Kat? Was he a Guns N' Roses fan too? "Oh, sure," he said, smiling. "I hear all the rock 'n' roll from my son. It's mostly good." A group of teenaged girls walked over to the display, glanced at it, then moved on. When asked if they were interested in Chinese Democracy they laughed and said they were looking for the soundtrack to the movie Twilight. Joe Steffano, 47, of Clifton, New Jersey, refused to be photographed, but he picked up a CD. "Basically, I like all music," he said. "Rock, jazz, funk, classical. I've heard a few of the songs and they were pretty good. I'm hoping they'll grow on me. If not, maybe I can exchange this for something else." 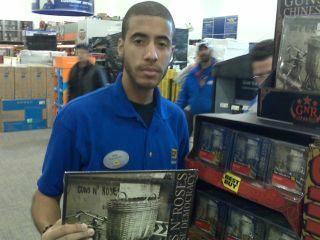 Finally, Jose Nunez, 38, a Best Buy employee who lives in West Paterson, strode over and grabbed a vinyl copy of the album. "I wish I could say I get this for free, but I don't," said Nunez. "But you know how it is - I contribute to the arts. "I think I'll like the record. From what I heard, it doesn't really sound like Guns N' Roses, but that's all right. A band's gotta move on with the vibe. To tell you the truth, I really want the vinyl because I'm hoping it's a collector's item in 10 years."